The late Frank Ponta was an elite athlete in his own right competing at five Paralympic Games, yet his lifelong work as a coach will see his legacy in sport remain for generations. Underscoring how much of an impact Ponta had on Australian sport will be his induction into the Sport Australia Hall of Fame as an Athlete and General Member. At the 33rd Induction and Awards Gala Dinner proudly presented by Etihad Airways on Thursday 12th October 2017 at Palladium at Crown his name will be etched alongside just six others who have received a double gong. Ponta was a pioneer of wheelchair sports in Australia competing in Rome at the first Paralympics in 1960 and is recognised as a vital figure in the development of wheelchair basketball. The dedication Ponta had as an athlete who excelled across many sports including wheelchair basketball, athletics, fencing and swimming shone through in his coaching career. For all his success as a competitor, including Paralympic gold at the 1964 Tokyo Games in the pool, his record as a mentor to many of Australia’s world-class athletes supersedes it. Nine-time Paralympic wheelchair racer Louise Sauvage OAM credits Ponta for much of her success and helping shape her life as a sportswoman as her first coach when she first got involved in sport. The four-time winner of the Boston marathon wheelchair race is now a coach herself and is continuing the work Ponta brought to the fore decades ago when para sport was in its infancy. “His legacy is all of us who have gone on to bigger and better things because of one man that really believed in us and gave us that opportunity,” Sauvage said. “He’s someone that needs to be remembered for all of those things, but just an awesome guy that just saw sport as a way of giving back. “I’d like him to be remembered for all the work he has done, encouraging the next generation – he did that so many times,” Sauvage added. Ponta’s philosophies on sport and how one should partake as an athlete were strong, often taking a hard line with his pupils when required and demanding they always put up their best effort, as he did. Yet at the same time he was a caring father figure to so many of those who he guided to achieve beyond their ‘potential’. That care and nurturing side of Ponta was there whether it was while working with nine-time Paralympic gold medallist swimmer Priya Cooper or a youngster starting up local basketball. “He was a great role model I think for a lot of the younger guys,” Sauvage added. “He was understanding but also pretty tough at times, but he was just really good because he knew how to get the most out of all of us with our different personalities. “Frank was an integral part of introducing me to the sports and giving me the values and teaching me about sportsmanship and about competing. “He taught me how to work hard and that if I wanted to do well I had to train,” Sauvage added. Ponta was born in 1935, the eldest of nine children who in his early teens injured his back in a car accident, aggravating a tumour that was later surgically removed. It left him a paraplegic, but did not stop him competing competitively in a number of para sports that were introduced to him during his rehabilitation program by John Johnston, a pioneer of wheelchair sport in Australia. 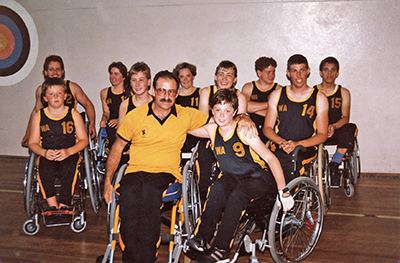 A significant landmark in his career was becoming one of the first members of the Australian wheelchair basketball team in 1956, four years before his Paralympic debut. The following year Ponta really made his mark on the world stage, competing in Australia’s first disabled sports team at the Mandeville Games, the precursor to the Paralympics. He won gold in the team sabre and silver in the shot put, javelin, and individual sabre – while also being captain/coach of the wheelchair basketball team. Four years later he won gold at the Tokyo Games in the 25-metre freestyle before claiming a bronze medal in 1968 in the backstroke in Tel Aviv, Israel. In total, he competed in five Paralympic Games across five sports in his career. Ponta would regularly visit the hospital to talk with anyone that was there as a paraplegic, giving them general guidance and advice, but also proposing para sport as an option. The care and desire to better the situation of anyone who shared a similar disability to his own carried through into his job as a coach, inspiring development and achievement. Sheryl Manolini was a good friend of Ponta’s since they met in 1972 and was truly honoured to accept his Paralympic Hall of Fame induction in London on his behalf in 2012. “I had never met anyone who was so dedicated to anything the way Frank was, it was amazing,” Manolini said. “Look, he’s a legend in his own right and trained other people to win gold medals. Manolini said she would be thrilled to accept the nomination on behalf of Ponta, who passed away in 2011, who joins Norman Von Nida OAM, Ron Barassi AM, Neale Fraser AO, Sir Donald Bradman AC, Sir Norman Brookes and Sir Hubert Opperman OBE as dual members in the Sport Australia Hall of Fame. “I just wish Frank was here to see and know all this, he did so much, he dedicated so much of his life to this,” she added. Frank Ponta will be posthumously inducted into the Sport Australia Hall of Fame on Australian sport’s night of nights – the sold out 33rd Sport Australia Hall of Fame Induction and Awards Gala Dinner – proudly presented by Etihad Airways, on Thursday 12th October at Palladium at Crown, Melbourne.